The municipality of Shantytowne invites you to join us for a visit, long or short. We offer a variety of housing options, providing you bring your own tent! Your stay with us will be ably overseen by our administration, supported by our star engineering department helmed by SMELD, and ably provided for and entertained by all within the city limits. Immigrants of all folkie varieties are invited. Bring an instrument if you have one and just relax! 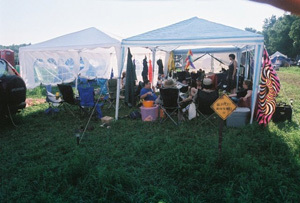 Shantytowne's next physical manifestation will take place July 22-26, 2009.